Quiet Cul-de-Sac location, pool sized lo Boasting 4 Bds, 2 Baths, plus a Bonus Room (not included in the sf) w/ french doors. Attention to detail shines through with every upgrade. New custom paint & new carpeting. Tile floors, ceiling fans, built in shelving, granite countertops and beautiful tile work done in the remodeled bathrooms shower and tub areas. Elegant Kitchen with granite countertops, stainless steel appliances, a spacious peninsula with pull up seating. Walk to award winning schools!, Perfect Single Story family home in Del Mar Heights, nestled in a quiet Cul-de-Sac. Boasting 4 Bedrooms, 2 Full Baths, plus a Bonus Room (not included in the square footage). Attention to detail shines through with every upgrade. New custom paint, new carpeting, tile floors, ceiling fans, built in shelving, granite countertops and beautiful tile work done in the remodeled bathrooms shower and tub areas. 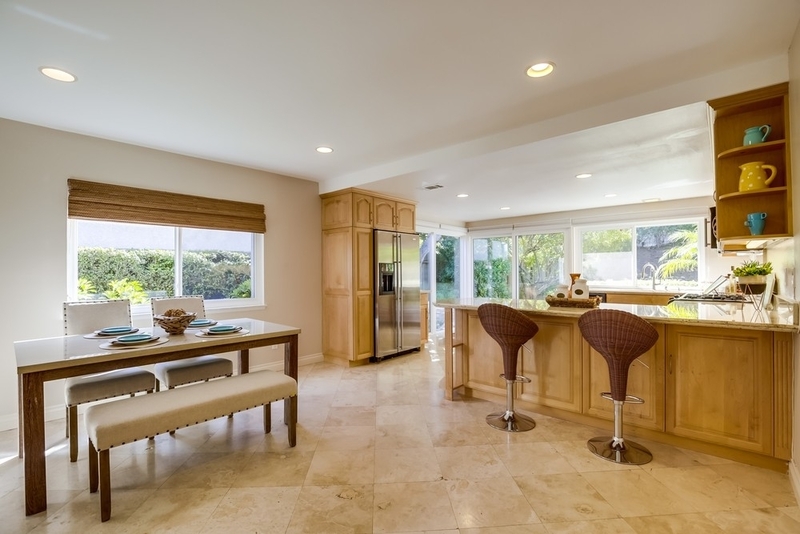 Elegant Kitchen with granite countertops, stainless steel appliances, a spacious peninsula with pull up seating and a breakfast nook that is surrounded by views of the parklike backyard. Bonus Room off Family Room is perfect for an Office, Play Room, or even a Spare Bedroom. Large Entertainers pool sized backyard with ample hardscape and grass area to do whatever you want with! Del Mar Unified School District. Walking distance to Del Mar Hills Elementary and steps to Crest Canyon, with multiple walking trails that lead you to the Quaint town of Old Del Mar.